I wrote this article to help simplify the process of combining multiple subnets. Refer to the exhibit. The Lakeside Company has the internetwork in the exhibit. The Administrator would like to reduce the size of the routing table to the Central Router. Which partial routing table entry in the Central router represents a route summary that represents the LANs in Phoenix but no additional subnets? 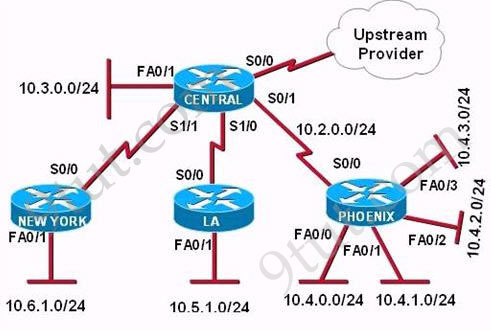 All the above networks can be summarized to 10.0.0.0 network but the question requires to “represent the LANs in Phoenix but no additional subnets” so we must summarized to 10.4.0.0 network. The Phoenix router has 4 subnets so we need to “move left” 2 bits of “/24¿-> /22 is the best choice -> D is correct. Starting from right to left. You may have come across the question "how many TCP ports or UDP ports are there. If you're wondering about the other Network IDs and Broadcast IDs of the separate networks before they were combined, just remember that there can on be 1 Network ID and 1 Broadcast ID per network. When you combine networks, the IDs in the middle disappears. It's like welding 2 metal rods together in a straight line, you will only have 1 rod with 2 ends after joining them. Now, after taking you through that whole session, I guess you're probably already considering abandoning networking for something else less tedious. Well, don't run yet. I have an easy solution for you. That is the trick folks!